Below is the text of a talk I gave at the Wheeler Centre last month as part of the series Australian Literature 101. I was asked to discuss Ray Lawler's Summer of the Seventeenth Doll, which allowed me to expand some of my earlier responses. Most of all, I'm struck by how Olive has most often been seen as a secondary and ultimately childish character, when I've always thought the principal tragedy of the play belongs to her. The significance given to the Doll as a unique, groundbreaking Australian drama, the “Great Australian Play”, has meant that it has been largely read through a lens of cultural identity, which I think has inadvertently obscured some of its interesting aspects. I agree with everyone, however, that it’s a thoroughly Australian play. Its cultural status has also obscured other plays of the time that might have an equal claim to attention. All the same, it deserves its place in theatre history. I don’t believe it’s a great play – Australian playwrights have arguably written works of greater theatrical and literary significance. Even in its own time it broke little new ground: it opened in London the week after the premiere of John Osborne’s The Entertainer, which starred Laurence Olivier. Next to The Entertainer, the Doll, as a well-made three-act play, appears a little old-fashioned. But it is churlish to deny that the Doll remains a compelling drama sixty years later: it’s a realist tragedy that still has the capacity to strike home. If anything makes a classic, it’s the ability of a work to remain vivid, a quality of suppleness that allows it to speak to us powerfully in times different from those in which it was written: and the Doll certainly qualifies. Lawler’s play has suffered from its classic status, as much as it has benefited from it: the nimbus of nationalistic pride, and especially the masculine ethos that goes with that, has tended to obscure its more interesting aspects. Armfield’s magnificent production earlier this year revealed it to be a play of more complexity and genuine power than is usually assumed. I hadn’t seen it, or thought about it much, since I saw the 1978 MTC production in high school: for me, as for many others, it was a dusty part of our theatrical heritage, an achievement worthy of genuine respect, but perhaps not of huge intrinsic interest. Armfield’s production reminded me, first of all, just how well-written it is: it’s an impeccably structured play without one ounce of fat, in which every utterance works inexorably towards its shattering climax. 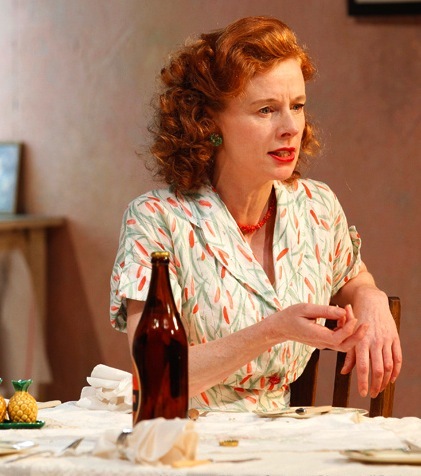 The other thing that struck me was that in Olive, then played by Alison Whyte, we saw a protagonist every bit as tragic, every bit as iconic, as Willy Loman in Arthur Miller’s Death of a Salesman. For me, Olive is the central character – hers is the desire which holds the dream together and which, finally, destroys it. Although the tragedy in the play belongs to all the characters, it belongs most of all to Olive. Lawler's story of itinerant cane cutters who migrate to Melbourne every summer for the lay off is a parable of fantasy coming into brutal collision with reality and, like all tragedies, a meditation on mortality. For sixteen years, Roo and Barney have returned to their lovers Olive and Nancy, for a white-hot summer of love in the Carlton boarding house run by Olive's mother: each year Roo brings Olive a kewpie doll, as a token. But now Nancy is gone: she has married a bookshop owner and settled down. Olive, refusing to face the implications of Nancy's desertion, has roped in her barmaid friend, the respectably widowed Pearl, to take Nancy's place. When the boys arrive, it's clear that all is not well: Roo is broke, and his and Barney's relationship simmers with unsaid hostilities. These have been catalysed by the arrival of a young ganger, Johnnie O'Dowd, whose youthful virility shows Roo that he isn’t the man he once was. As the play continues, the fantasy crumbles under the sceptical eyes of Pearl: against Pearl’s sardonic observations, the other observer, Bubba, a young girl who lives next door, asserts the reality of the romance. Roo gets a job at a paint factory, and finally, in the shattering conclusion, proposes marriage to Olive: a proposal that she rejects in horror. In the final scene, Barney and Roo, both broken men, leave the house forever. The Doll employs an Australian idiom that has largely vanished from our cities, with the broad vowels and supple, ironic wit that later became caricatured as the "larrikin" or the ocker. In Lawler's hands it's plain and unexaggerated, the speech of working class people. The play's three-act structure is similarly unadorned. Armfield’s stripped down production exposed the bones of the play, and showed what it always has been: a startlingly well-written text, of its time and place, but resonating beyond them. As John McCallum notes in his book Belonging: Australian Playwrighting in the 20th Century, the Doll was “the first professionally produced Australian play outside the commercial theatre to receive any serious professional support and backing.” He argues, rightly I think, that much of its subsequent success was in luck and timing. It’s worth remembering the fate of Oriel Gray’s The Torrents, which, with the Doll, was joint winner of the Playwrights Advisory Board’s play competition. In fact, the judging panel considered The Torrents “the more complete play”: but Gray’s work, without the support of a production, sank into total obscurity. This illuminates a major aspect of theatre writing, which doesn’t apply to works such as poems or novels: playwrights must have a theatre to write for, and a play isn’t complete until it’s produced on stage. This makes a play an impure artform, as it necessarily becomes the point of focus for a range of other disciplines that together produce the finished (or, perhaps, to steal a phrase from Duchamp, the “finally unfinished”) work of art. Because of this, there’s been a lot of discussion in recent years on whether plays can be considered “proper” literature: if the text is subject to such instability, to the rigors of interpretation and reinterpretation through the visions of directors, designers, actors, musicians, can it really be thought of as literary art? Some playwrights, inverting the literary snobbery too often directed against their artform, themselves resist the idea that plays are literature. Myself, I don’t see the argument: to me it makes no sense at all to deny that plays are literature, especially in an Anglo culture which considers its greatest literary genius to be Shakespeare, and which traces its roots back to Aeschylus. You can read plays, just as you can read other books, and they exhibit all the qualities we expect from other literary writing: formal curiosity, style, intellectual and emotional engagement. Well, at least, good plays do. No matter how good they are, playwrights need a theatre to write for, and in the 1950s it scarcely existed. The Doll, with its unapologetic Australian vernacular, its invocation of the bush legend and its contemporary urban setting, burst on the scene in 1955 with stunning effect. According to critic Katharine Brisbane, it was a household name within a year of its premiere. This points to a common interpretation of the play as a “tragedy of inarticulacy”: as Brisbane says, one of the qualities of the play is “the economy with which [Lawler] expresses the inarticulate nature of the characters and the way the deprivation of language is related to a deprivation of spirit and intellect”. I would take mild issue with this: Lawler’s characters all seem to be, on their own terms, perfectly articulate to me. I’m troubled about the class judgment implied here, since these inarticulacies are seen to be the result of being uneducated, working class characters: it’s perilously close to saying that the inability to express feelings means that those feelings don’t exist. Lawler certainly positions the unseen Nancy as smarter, a woman who is forever reading books and who escapes the impending doom of the layoffs by marrying a bookshop owner. But I’d suggest that there’s a profound ambivalence here. One thing underlining this ambiguity is the fact that it’s the very articulacy of these characters that allowed them to create their alternative reality: the myths that they have constructed around their relationships crucially depend on the imaginative capacities of language. Nancy used to say it was how they’d walk into the pub as if they owned it, even just in the way you walked you could spot it. All round would be the regulars, soft city blokes having their drinks and their little arguments, and then in would come Roo and Barney… She always reckoned they made the rest of the mob look like skinned rabbits. Just as it’s language that builds the myth, it’s language that ultimately tears it down. Now nearing their their forties, Roo and Barney both find, to their bafflement and anger, that they are no longer young, that the youth and vigour which they took for granted has deserted them. But it takes Pearl’s innocent laughter at Barney’s toast to “glamorous nights” to rip away the final rags of the illusion. Roo is prepared to cut his cloth to his new circumstances, and gets a regular job, just like the soft city blokes, readying himself to make an honest woman of Olive. Barney, once the epitome of sexual charisma, finds himself mocked by the women who once succumbed to his charms. The quintessential henchman, Barney shifts his loyalty to the new alpha male, Johnnie O’Dowd. Reading the critiques of the Doll now, it’s striking how the action of the play is critiqued primarily through its male characters: Olive’s desires and struggles are seen as subordinate, certainly secondary, to the drama of the men. In 1987, Jane Cousins wrote that “Roo is the term of reference and Olive merely the site at which his new identity is to be confirmed.” Certainly, the final image is the play is of the two men leaving together, after a sudden, “uncharacteristic”, gesture of genuine friendship from Barney, in which he touches Roo's shoulder and gently leads him away. Here the glossy ideal of mateship that the two men supposedly embody is stripped of its mythos, and reduced to a single moment of insight and compassion. I’m not sure that this gesture really legitimates, as Cousins claims, “a nostalgic return to [the] imaginary unity [of the outback hero]”: it’s far too ambiguous. In its unexpected tenderness, it could be seen as the introduction of a feminine understanding into the aggressively masculine ideal of mateship. It's certainly an image of overwhelming defeat. The character who is most invested in the ideal of the layoff is Olive herself: she is the person who passionately resists change, and who will destroy everything rather than compromise her dream. Olive is a huge role, both emotionally and in terms of her presence on stage: we see her well before Roo and Barney, she drives the action, and the dramatic climax belongs to her. Why does Olive so passionately resist Roo’s offer of a wedding ring? Lawler himself, implicitly rejecting the grander notions that he was making a narrative of Australian identity, said that he thought the Doll was simply a play about “alternatives to marriage”. With this in mind, it’s worth looking again at the relationships portrayed in the play. I read the Doll rather as a critique about the difficulty of sustaining equality in sexual relationships in a society in which roles for man and women are rigidly defined. The dream that is destroyed is a dream – Olive’s dream – of equality. Behind this is a hint of another Australia, one that in the late 19th and early 20th century bridged the urban and rural divide. This is the Australia that was thought of as the “working man’s paradise”, in which the rural shearing unions were as crucial to social progress as the building unions in the cities; the country that was the first to introduce the eight hour day and only the second to give women the vote. I think it’s not too much of a stretch to read the Doll as an elegy, not for the "bush", but for this egalitarian vision: it's a portrayal of how this idea of Australianness began to vanish after World War 2, when working class aspirations began to give way to the middle class values espoused by Pearl. It’s certainly uncontroversial to say that the conflicts in the Doll are driven by socially gendered constraints, symbolised most powerfully by the marriage which the major characters have rejected. But if we take Olive to be an active protagonist, rather than a passive reflector of the men, it seems to me that Olive isn’t rejecting the “feminisation of the outback hero” so much as demanding those outback freedoms for herself. She seeks to reconstitute those freedoms in an urban context, making herself a “mate” as well as a lover. When she hears that Roo is broke, she says aggressively “What’s wrong with me? I’m workin’, ain’t I?” Roo, defending his masculine pride, tells her he won’t bludge off her, and insists that he will get a job: but Olive herself has no problems at all with the idea that he might be financially dependent. Olive’s resistance to marriage has been taken to be a proof of her refusal to “grow up”: it’s seldom been seen as a resistance that goes to the heart of her autonomy as a woman. At the end of the play, in a brief but significant moment of rapport, Roo says to Olive: “Y’know, a man’s a fool to treat you as a woman. You’re nothin’ but a little girl about twelve years old.” Olive’s response is to refer to her job: “Try telling that to the mob on a Saturday night.” Roo insists: “”S true, all the same,” and then attempts to persuade her to take the day off work. It’s an offer that Olive tellingly refuses. This statement has usually been taken as an assertion of Olive’s dependence on Roo, rather than an expression of her independence. Yet when it comes to the crunch, Olive gives up her man, but she won’t give up her job. Our last sight of her is after the dream has crashed: in a magnificently melodramatic moment of renunciation, Roo kneels down and tells her, “This is the dust we’re in and we’re gunna walk through it like everyone else for the rest of our lives!” Olive reacts with physical anguish, “doubling over herself on the floor as if cradling an awful inner pain”. What she is mourning is her sexual life, which is now over: the trade-off that women must make, choosing between autonomy and sexuality, is inescapable. Perhaps the worst possibility of all is that the equality she thought she possessed never really existed. That’s the real betrayal in Roo’s proposal: to him, she is only a little girl. In the face of this, stumbling with shock, she does the only thing left to her: she picks up her bag and goes to work. In the Doll, Lawler puts both masculinity and femininity under the burning glass. The roles evaporate in the heat of the drama and reveal desperate people seeing through a glass darkly, aware of how they are trapped, but unable to do anything about it. None of the characters is socially conventional, but for all their refusal of their allotted roles - as dutiful working husband or suburban wife - they remain trapped: Roo and Barney in their limited ideals of manhood, Olive and Pearl in different imprisonments of femininity. Their tragedy is that in the society in which they live, there is no escape for them: the only alternative to accepting the deathly conventions they have abjured all their lives is absolute loss. I think that central dilemma is the reason it remains such a powerful play today. I agree with you on so many levels, but can't help saying "Of course Olive is the tragic hero!" Er... I think I need to explain. As a text, The Doll was part of my high-schooling in the late eighties and I have not yet seen it performed. Even then read it and its 'prequels' repeatedly in my twenties. Your commentary has made me re-examine my fascination/obsession with it. I'm a bilingual first gen migrant and I (though female) actually identified with Roo and Barney as fellow migrants. The cane fields aren't quite as far away, but I fully related to the thrill and curiosity that an exotic might garner. As a result, I took the choices of these characters as inevitable: do they return to the homeland even though it to longer exists in a form we recognise, or have currency in? ; do they repeat the rituals/stereotypes of their culture even when it is no longer valid, honest, purposeful? ; or do they assimilate themselves to the reality/rituals/expectations they are surrounded by, in order to ensure something survives. In the meantime, of course, they are surprised by the fact that the 'newer' migrant gets the good stuff by virtue of their 'newere' newness, their youth, their immediacy etc. even as they are losing previous currency and making the hard choices. As we experience (in my case read) the play, it is Olive's trajectory through loss and grief that we experience. Roo and Barney are already up to 'anger' and beyond. Olive has barely begun on denial and doesn't move beyond it, even as Nancy (off stage) has managed to remove herself from the issue and find a new life. I always found Olive tragic (in the way Roo and Barney are not, because they will support each other) because her future cannot exist. When Olive is confronted by her reality is only able to offer denial. The characters who suround her have already indicated that they will not support her. I have always found that inexpressibly sad. With respect, that Olive is the tragic hero in the Doll - even that her struggle is one against patriarchal convention, and for her own autonomy - seems incredibly obvious and uninspired. The 1995 MTC production with Geneveive Picot as Olive and Frankie J. Holden as Roo was an even stronger instantiation of your argument than Neil Armfield's recent production. Perhaps if you'd seen it you'd sound less like you're reinventing the wheel. I broadly agree with you, but I do think you're drawing a long bow to argue that Olive's breakdown and rejection of Roo is about "mourning her sexual life". She's a Carlton barmaid. She can get a root if she wants one. You're on firmer ground with your line about Roo seeing her as a child. The marriage proposal comes right after Roo treacherously discusses Olive with Emma, who also sees her as hopelessly dependent. It interests me, in terms of your argument, that you do not mention Emma at all, despite Robyn Nevin's bruising interpretation of the role. How does Emma fit in with what you're saying? I'd point out, in support of your thesis, that Olive IS Roo's equal. She matches him stride for stride in terms of character. She is just as good-hearted, just as capable, and just as proud. It is the latter that's crushed by Roo's proposal and she reacts as vengefully and destructively as he does. Emma and Roo are deceived - Olive knows she's walking through the dust, but she won't, CAN'T, walk through it "like everyone else" and retain what she has. Her material independence, of course, but something more: her very singular imagination, which requires the liberty of distance to dream its way around convention. Hi Cameron and Long Time Reader - Thanks for your comments. I wholly agree it's an obvious argument. But I did a fair bit of reading around the play, and I am yet to see anyone write about Olive as the major protagonist. Even the feminist commentary places Olive as a secondary character, with the actual drama being considered as belonging to Barney and Roo. Can you give me any pointers to who has? I wish I could. If it's true there isn't any (and there must be, surely), Australian drama criticism is in even worse shape than I'd imagined. I can't say I've read everything, by any means. Over to you, internets. I don't think that Long Time Reader was referring to Olive mourning over the fact that she might never get laid again Cameron. It was meant as Olive facing the prospect that she might never again experience her sexuality through intimacy and love. From the beginning of time, women have had no trouble getting a casual root, regardless of whether they've been bar maids or queens. Of course, when a relationship ends for you, it's clear that you will have another one.Try to imagine being Olive's age, with a similar relationship history. You are in a place, time and culture, where the prosect of meeting someone you could lust over as well as love, is remote, if not impossible. I agree that even this alone, is not the only reason for Olive's breakdown, but it plays a significant part. By the way, how old were you when you saw the 1995 version? Or did you see it later on video/DVD? This question isn't a put down, because I think you're a marvellous theatre critic. But to have perceived what you did at such a young age is very unusual. Maybe you've just always been a wunderkind? The condition of Emma - "sexless", eccentric and alone - is what Olive has in front of her. Whether she has a root or not is a pretty trivial question, given what's at stake. Just realised that sounded pretty blunt! I'm on an iPhone in Darwin and trying not to make typos. Thanks for the comment, Jane. Not entirely sure what you mean, Leonid. Though I understand the main problem with the film is that they changed the ending so everything turned out happy. I'd say that changing the ending so Olive and Roo marry changes the meaning substantially. I haven't seen the film, so I don't know what it's like: but it certainly won't be the play. The root comment was crass, and you're quite right that Olive is mourning "that she might never again experience her sexuality through intimacy and love." But I think it's something more too. Olive has a horror of Pearl's prim middle-class judgement of her. She doesn't want to see herself as a 'loose woman', and what she has with Roo is an idea that is more meaningful to her than conventional marriage, because it is her idea, her imagination, her dreaming. What does Olive imagine her future to be at the end of the play? Alison's point that she sees Emma's fate is a good one, but perhaps she also, finally, sees herself through the eyes of the life-denying conformity that has always scarred Australian culture. Both are true, and they're both awful. I was 19 when I saw the 1995 Doll, marvellously directed by Nevin herself. Wunderkind. Heh. Perhaps I was, although I'd point out that one cannot 'always' be or even have been a wunderkind. These days, I'm an ex-genius. im going to have to read the play again...i cant get the understanding...that Olive is a tragic hero, honestly.